TARRC’s Head of Engineering Design, Dr Alan Muhr, has won one of the ACS Rubber Division’s Science & Technology Awards – the most prestigious awards available to rubber professionals. He was presented with the Melvin Mooney Distinguished technology Award at the 187th Technical Meeting April 27-30, 2015 at the Hyatt Regency Greenville; SC, where he also presented a paper – Stress-strain Behaviour of Rubber: Applications of Models. Edward L. Miller, Executive Director – Rubber Division, ACS commented ‘We are pleased to honour Dr Alan Muhr with the prestigious 2015 Melvin Mooney Distinguished Technology Awardfor exhibiting exceptional technical competency by making significant and repeated contributions to rubber science and technology. His contributions to our great industry are valued and so deserving of the recognition he receives through this award’. The award is named after Melvin Mooney, developer of the Mooney viscometer and of the Mooney-Rivlin hyperelastic law. 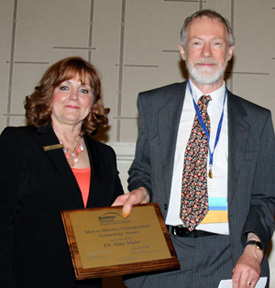 Dr Muhr (pictured right with the Rubber Division's 2014 Chair-Elect, Terry Delapa) is the latest in a long line of TARRC scientists who have won some of the most prestigious awards from the Rubber Division of the American Chemical Society. One of TARRC’s senior scientists, Dr Pamela Martin, also presented a paper at the Technical Meeting - Visualizing Tyre Wear.